Hermite curves are very easy to calculate but also very powerful. They are used to smoothly interpolate between key-points (like object movement in keyframe animation or camera control). Understanding the mathematical background of hermite curves will help you to understand the entire family of splines. Maybe you have some experience with 3D programming and have already used them without knowing that (the so called kb-splines, curves with control over tension, continuity and bias are just a special form of the hermite curves). To keep it simple we first start with some simple stuff. We also only talk about 2-dimensional curves here. If you need a 3D curve just do with the z-coordinate what you do with y or x. Hermite curves work in in any number of dimensions. These 4 vectors are simply multiplied with 4 hermite basis functions and added together. Below are the 4 graphs of the 4 functions (from left to right: h1, h2, h3, h4). h1 starts at 1 and goes slowly to 0.
h2 starts at 0 and goes slowly to 1. Now multiply the startpoint with h1 and the endpoint with h2. Let s go from 0 to 1 to interpolate between start and endpoint. h3 and h4 are applied to the tangents in the same manner. They make sure that the curve bends in the desired direction at the start and endpoint. All this stuff can be expessed with some vector and matrix algebra. I think the matrix-form is much easier to understand. To calculate a point on the curve you build the Vector S, multiply it with the matrix h and then multiply with C.
I wrote a separate page about bezier curves. Sure, this C-style pseudo-code won't compile. C doesn't come with a power function, and unless you wrote yourself a vector-class any compiler would generate hundreds of errors and make you feel like an idiot. I think it's better to present this code in a more abstract form. h3*T1 +                    // point along the curve. I know... controlling the tangents is not easy. It's hard to guess what a curve will look like if you have to define it. Also, to make a sharply bending curve you have to drag the tangent-points far away from the curve. I'll now show you how you can turn the hermite curves into cardinal splines. a is a constant which affects the tightness of the curve. Write yourself a program and play around with it. ( a should be between 0 and 1, but this is not a must). The Catmull-Rom spline is again just a subset of the cardinal splines. You only have to define a as 0.5, and you can draw and interpolate Catmull-Rom splines. Easy, isn't it? Take a math-book and look for Catmull-Rom splines. Try to understand how they work! It's damn difficult, but when they are derived from hermite curves the cardinal splines turn out to be very easy to understand. Catmull-Rom splines are great if you have some data-points and just want to interpolate smoothly between them. Tension: How sharply does the curve bend? Continuity: How rapid is the change in speed and direction? 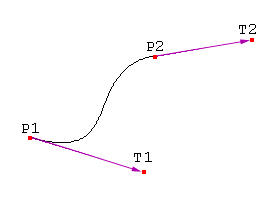 Bias: What is the direction of the curve as it passes through the keypoint? You might notice that you always need the previous and next point if you want to calculate the curve. This might be a problem when you try to calculate keyframe data from Lightwave or 3D-Studio. I don't know exactly how these programs handle the cases of the first and last point, but there are enough sources available on the internet. Just search around a little bit. (Newtek has a good developer section. You can download the origignal Lightwave motion code on their web-site). N is the number of frames (seconds, whatever) between two keypoints. What about the "normal" Splines? The other spline-types, beta-splines, uniform nonrational splines and all the others are a completely different thing and are not covered here. They share one thing with the hermite curves: They are still cubic polynomials, but the way they are calculated is different. Why does no-one care that it's almost impossible to do nicely formatted math-formulas in HTML? What's more important? Good design or good content? As always you might want to contact me.